Priests are available for confessions before all masses or upon request. Please call the parish office at least six months before the wedding date to book an appointment with the priest. Check out "From this day forward" for more info about the marriage preparation program sponsored by the Archdiocese of Montreal. In addition to our “announced” Masses (published in the bulletin), we will now also offer unannounced Masses. An "unannounced" Mass is exactly the same as an "announced" Mass except that it is not published in the bulletin. An "unannounced" Mass is celebrated privately by the priests at a Mass at which they have no other scheduled intention. Unannounced Masses are celebrated at the earliest convenience of the priest celebrating the Mass. The donation for an "unannounced" Mass is $5. Unannounced Masses may be arranged in exactly the same way as an announced Mass, by contacting the parish office. 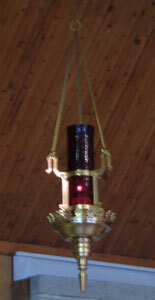 The sanctuary lamp signals the presence of the Lord Jesus in the Tabernacle and burns for seven days. We invite you to have the sanctuary lamp memorialized in the name of a sick person, a deceased love one, or a special intention, for a weekly donation of $20.00. Please call the office to arrange a memorial for the sanctuary lamp. 514-626-4111.